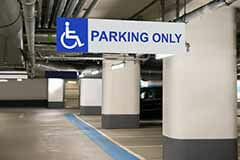 As a disabled person, going out in public can be a stressful ordeal if appropriate accommodations are not made available, such as accessible parking. Otherstressors includeramps and curbsides to allow one to enter establishments, or to avoid wondering if the restrooms will have stalls that are big enough for a wheelchair to fit into and/or not be occupied by an able-bodied person. Though accessible parking is just one of many problems I've illustrated, it's the first one we encounter when we leave our homes, and it's the one most easily addressed and corrected. We are all too well aware that one of the issues with accessible parking is the limited number of spaces available in parking lots to be utilized by those of us with disabled placards; add to that the illegal use by those who do not have placards or who abuse the use of placards by parking in such places without the person to whom the placard has been assigned. Regardless of whether you are driving or riding shotgun, it is equally frustrating to find someone illegally parked in a space that they should not be in, and your having to deal with the inconvenience of parking farther than you would-especially if there are no other designated parking spaces available. One way to "fight back," so to speak, against illegal parkers is by reporting them to the authorities. With technology, you do not have to flag a police officer to do this-your smartphone can do the work for you.Parking Mobility is a non-profit organization founded in 2009 that has created an application (or "app") disabled persons can download onto their mobile device to report offenders to the authorities. Using the app is simple: open it, capture three images, and submit the images through the app. Parking Mobility does the rest by sending your town or city the information you provided, and local law enforcement will be contacted about the accessible parking violation. This app provides an easy and safe way to advocate for yourself in your community by fighting against accessible parking abuse. The app is available for free in iOS and Android. Reporting accessible parking violators is one way to combat this issue. Advocacy, awareness, and education are also essential to reduce the likelihood of accessible parking abuse and ensure that everyone knows that these parking spaces are not "luxuries," but are truly vital accommodations for those of us who need them. Check out BraunAbility's Save My Spot page to learn more about what is being done in the fight for accessible parking and how you can get involved. Bio:Vilissa Thompson is a Licensed Master Social Worker (LMSW) from Winnsboro, SC. Vilissa has Osteogenesis Imperfecta (OI), a brittle bones disorder; is hard of hearing (HoH); and uses a manual wheelchair. Vilissa is the founder and CEO of Ramp Your Voice!, an organization focused on promoting self-advocacy and strengthening empowerment among people with disabilities. 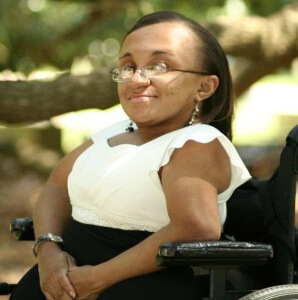 Being a disability rights consultant, writer, and advocate affords Vilissa the opportunity to become a prominent leader and expert in addressing and educating the public and political figures about the plight of people with disabilities, especially women of color with disabilities.